Will the fallout from the European and local elections take out one of the party leaders? This time next week we will be sifting through the results of the local elections in England and Wales and waiting for the weekend counting of the votes in the European Parliament elections. It will be a nervous time for many, not least the party leaders. None of the three main party leaders is 100% secure in their job and certain to lead their party into the General Election next year. These elections will be the last serious threat any of them face to their leadership, barring some unforeseen scandal or political calamity. The council elections taking place next week last took place on the day of the General Election in 2010 and include all the seats in the London Boroughs and some other major cities so they will be a very useful comparison for spotting trends and shifts in support over the last four years. The European Parliament elections, of course, are national and will be seen by most political analysts as the more important set of results. So, who will be the more nervous about these elections? Cameron, Miliband or Clegg? I think the most vulnerable of the three is Ed Miliband. If Labour is to pose a serious challenge to emerge as the largest party at Westminster next year it must make significant gains in the local elections and top the poll in the European elections. Anything short of that will be a major setback and the trends in the opinion polls over the last week suggest that is the uncomfortable scenario Labour is facing. Detailed analysis of recent polls shows Labour trailing badly in terms of seats at the next General Election. If this trend is confirmed next week, Ed Miliband will be a very nervous man indeed. The rumblings about his ineffective leadership have already started and will get louder if Labour does not top the European poll next week. If the predictions of some polls that Labour will fall to third place and the Tories top the poll become reality then his leadership will come under enormous pressure. The one thing that might save him in those circumstances is the lack of an alternative, both in terms of a policy narrative and someone to champion it. Cameron looks more confident by the day. His MPs are happier with his leadership and more optimistic about their own chances of winning next year than they have been for a long time. He could actually afford for the Tories to come a narrow third next week and not be too concerned. Obviously, the Tories big worry has been the rise of UKIP but I think they have seen enough over the last few weeks to give them hope that they can contain the UKIP threat, the result of the Newark by-election on 5 June notwithstanding. A big UKIP vote there will start alarms bells ringing: a win will see some Tories reach for the panic button. The hardest one to call is Nick Clegg. One minute he looks to be the master of his party despite the the tough times they are facing, the next he looks to have the skids under him. He has the aura of a survivor about him. Whether that will be the best thing for the Lib Dems is an open question. Many Lib Dems will take comfort from forecasts that shows them with 30 seats at the next General Election with the Tories short of an overall majority as that would probably mean a continuation of the present Coalition. Others in the party will be concerned that it rules out the possibility of any deal with Labour and would confirm the continued rightward drift of the Liberal Democrats. The real danger of another Coalition with the Tories will be of a permanent split in the party with the gradual absorption of pro-Tory Liberal Democrats into the Conservatives as happened from the 1930s to the 1950s. That analysis is for another day, however. 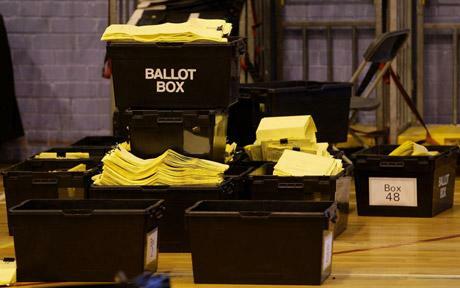 Most Lib Dems seem braced for a poor result in the European Parliament elections. The question is just how poor does it have to be to threaten Clegg’s leadership? A complete wipe-out in terms of MEPs would be a disaster and might set him on course for the exit door with Tim Farron the most likely successor. Anything better than that and he will probably hang on. The other big question posed by the recent polls is: has the UKIP bubble burst? There are signs that the greater scrutiny of its policies and people surrounding the seemingly undentable Nigel Farage is beginning to take its toll. But they have taken up issues that matter to large numbers of voters and the tricky challenge facing the other parties is how do they respond to that without alienating their own traditional supporters? Failure to top the poll next week will be a serious blow to UKIP and give everyone else a little breathing space to consider that challenge.